An O-Ring loaded seal has the highest level of sealability for all the dual-action piston seals. Similar in function to a capped T-Seal, the apex seal uses an elastomer energizer to activate the thermoplastic sealing element. The sealing element can be made of either Lubrithane or Fluorotrel, both of which offer superior wear and extrusion resistance. 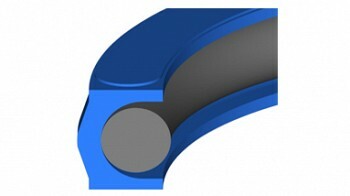 A back-beveled sealing lip gives this seal excellent sealability at both high and low pressures. Features: Square seal, back-beveled lip; energizer and low pressure seal ability. Applications: Mobile hydraulic, agricultural, vacuum, high pressure and bi-directional sealing.